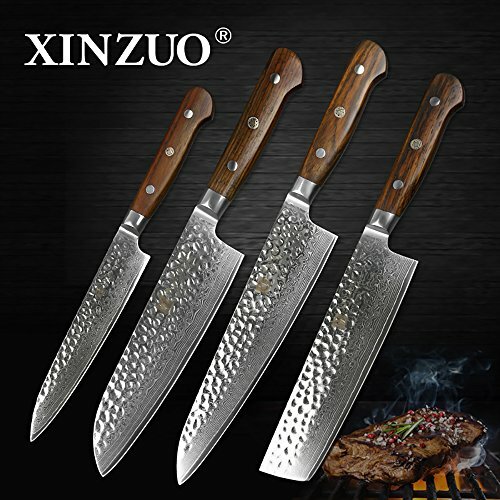 Why choose Damascus steel kitchen knife? Ceramic kitchen knife: high hardness,sharp,but easy to break,not durable. Damascus steel knife produced through composite forging process,combination advantages of high sharpness,blade durable,strong anti-rust performance, health and beautiful fashion, etc. It is the best choice for you kitchen,withal is an excellent gift. For cooking shows and performances: a beautiful chef knife can make you more attractive,attracts more viewers for you. Whether you are a professional chef,a home cooker,or a culinary student,this knife can meet your needs! You are making the right decision doing business with our company. We'll provide you the finest product and service, or full refund! Add this Chef's Knife to your cart with NO RISK and enjoy the difference experience of good knife. ☆☆ Shipment: Ship via DHL, will be delivered within 5-8 days. ☆☆Beautiful: There is unique Damascus steel natural pattern in the blade, beautiful, charming and fashion. If you have any questions about this product by XINZUO, contact us by completing and submitting the form below. If you are looking for a specif part number, please include it with your message.